White teas are one of the Fujian district’s (China) main specialties. The most well-known ones are named Bai Mu Dan (White Peony) and Yin Zhen (Silver Needles). 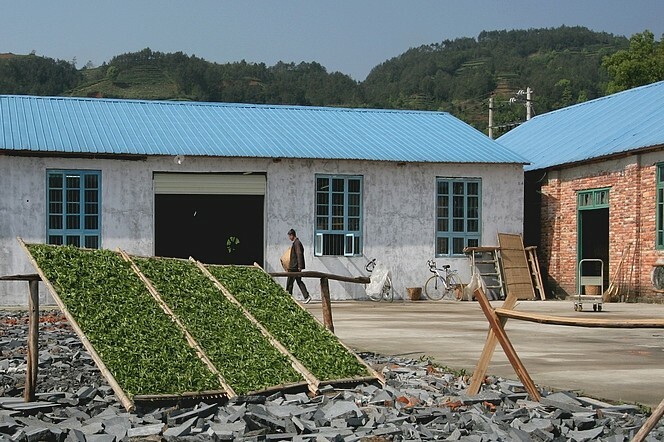 The manufacturing process of white tea is quite simple, as it can be summed up in two words: withering and firing. Traditionally, white tea is withered in the open air, just like here on these large bamboo pans which have been placed according to the course of the sun. This procedure will last from 48 to 60 hours. It is thus better to take the colour of the sun in consideration before plucking the leaves, in order for the harvest not to be ruined by the rain! Hello, I am water in suzhou, there is one of chinese famours tea as bi luo chun or name pi luo chun, if you wounld like , you can come to suzhou for a visit the tea garden . In some countries, people don’t just drink tea, they eat it. Like here, in Burma, where they ferment tea leaves in bamboo tubes before serving them drizzled with sesame oil….